Would you like to get a hold of our home-style pork barbecue recipe? It’s a sticky savoury treat. This simple recipe is easy to follow, easy to adjust, and made with common ingredients that might as well be available to your homes. If you love pinoy-style bbq's just like manong's, this post may be for you! Filipinos that we are – hubby and me, barbecue only means pork barbecue. This blog post talks about pork barbecue, home-made, and pinoy-style. This barbecue sauce or marinade works well with chicken, too. If you’re more of a chicken lover, you can also use this sauce on your chucks. To be on the healthier side, we used lean pork in this recipe. We’ve had our share of no-no’s for the week so we are keeping it lean and mean for the coming days. Normally, pork shoulders (kasim)or those parts with fats are used in cooking pork barbecue. It’s tastier given the flavours of the rendered fats on the meat. I would prefer using a fatty meat on pork barbecues. But since we’ve had too much saturated fats for the week, we’ll keep it lean this time. At any rate, choose your own meats and parts of the meat that you like on your barbecue. 1. Put the pork (or your preferred meat) in a deep dish, preferably with a container with a lid. 2. Mix up all the other ingredients in the same dish. 3. Soak the pork in the marinade. Make sure the all the meat is prepped. Pinoy-style pork barbecue is rather sweet. This recipe, on the other hand tries to control the sweetness of the dish. (My husband doesn’t have a sweet tooth! Boo-hoo!) So, if you’d like a rather sweeter pork barbecue you can adjust it to your liking. Just a reminder… the soda in the recipe doesn’t only tenderize the meats, it also adds sweetness to it. So, just take note of that before you go crazy on the sugar. 4. Cover and leave overnight or for at least 4 hours. I know, overnight! It's all worth it, though. The meat would be oh! so tender and the flavours would definitely stick. 5. Put the meat on skewers or sticks when you’re ready to cook. Apply or spray a little oil to the grill and/or the meat itself so that the meat won't stick to the grill wire. Have these pork barbecue yummies with hot steamy rice with a side dish of vegetables or fruits. While cooking pork barbecue is normally done during gatherings, you don’t have to wait for an occasion to enjoy them. I say this because the hubby and I finished the dish all by ourselves. (Whoopsie!) 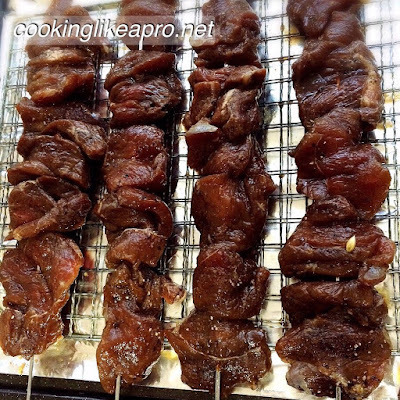 You can prepare the dish at night time and have pork barbecue for lunch on a weekend. Wouldn’t that be nice? On a personal note, I think this is a healthy version of cooking or preparing pork barbecue. Notice that we didn’t use any barbecue sauces off the shelves? You know exactly what went in to the food you’re eating. And still, the flavours are there. It is a rather simple recipe that you can do at home.